This week we got more blackberries (YUM!) as well as two different kinds of eggplant: Japanese and Italian. From what I can find, the Japanese eggplants should be milder than the Italian eggplants. It will be interesting to see if it is a noticeable difference. Perhaps I’ll roast one of each and try them together. I’m planning on making a fritatta with two of them. I also may make Uncle Isak’s eggplant salad, which is to die for – roasted eggplant, garlic, olive oil. Mmmm. I can use some of the gigantic elephant garlic included in the bag! The cucumbers and beets will become part of my now almost daily chopped salad. My mom made a chopped salad when I was visiting her this summer and it’s my new favorite. I think the beets will be pretty in there with the cucumbers, some feta cheese, and green onions. 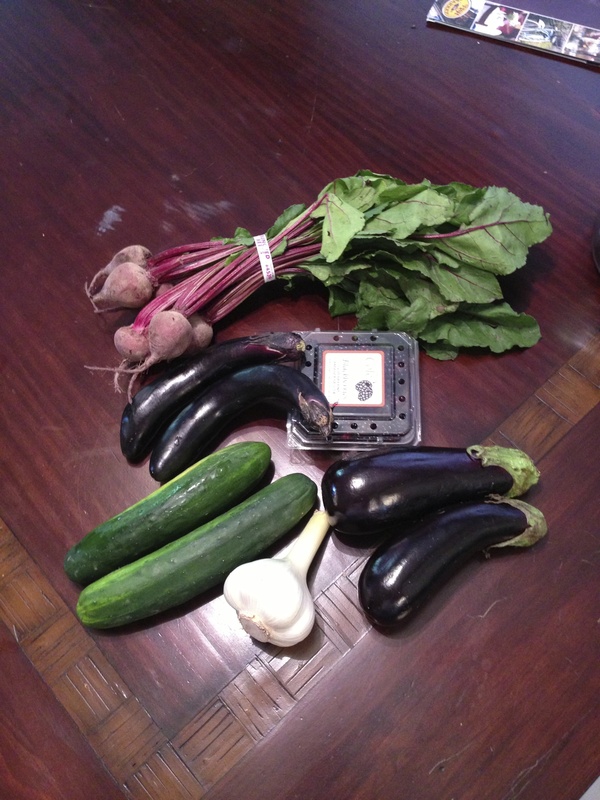 We’re back to local produce in the CSA, which is nice. All the items come from within 50 miles of the Farmer’s Market, from farms in Virginia and North Carolina. This is my first summer CSA here so I’m curious as to what kinds of fruit (peaches, plums, etc) we might get as the summer goes on. I like that Japanese eggplant but I haven’t ever received it in my CSA.